Aside from plaid-clad hipsters and mountains of barbecue, every South by Southwest attendee is sure to see one thing: Completely idiotic startup marketing campaigns. Lyft, the car-sharing service, touted offering free piggyback rides to SXSW attendees weeks before the start of the show. Or take the hook-up site Bang With Friends, which promoted its one-off site, “Bang With SXSW,” a way for attendees to freely hook up with one another. It’s gross, fairly shameless, and all too typical of events like South By. But one unlikely company is co-opting the approach, while drawing more attention to itself. In the weeks leading up to SXSW, a series of mysterious packages started being sent out to companies of import and some journalists. The contents included a set of instructions and one single, neatly wrapped object: A yam. 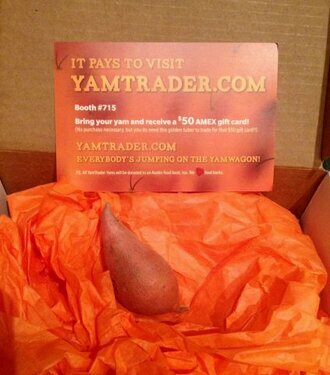 Those who received the yams in the mail — from “Yamtrader.com” were pitched on a new startup that, basically, sold itself as “an online marketplace for yam enthusiasts and traders.” It was absurd. Yet attendees were encouraged to bring their yams to South By, where they could be traded in for a $50 AmEx gift card. What they found when they reached South By on Sunday morning wasn’t a booth full of potato lovers. It was Tri-Net. What is Tri-Net? It’s a 25-year-old cloud services company that deals with HR, payroll and IT backend issues for smaller startups, who may have a good idea for a company, but have little backend business acumen. It’s pretty big, too; it’s home to more than 1,500 employees, and works with upwards of 7,000 clients. I get it. IT and payroll services are about as exciting as attending an enterprise conference after taking a Xanax. So you have to resort to guerilla, somewhat unconventional marketing tactics to get noticed on occasion. But Tri-Net did them one better. Theirs is a sort of meta-commentary on startup marketing on the whole, a tongue-in-cheek gesture on the stupidity of some single-serving companies that are appearing out of Silicon Valley these days — much less with millions of dollars in venture capital funding. By contrast, something difficult to market may prove more useful; it’s why the hottest topic in the Valley these days is indeed the enterprise (even if it is boring as hell). But whatever the case, it worked. Tri-Net got people to bring in the yams, raised some awareness, and found some new business prospects. Not a bad troll, fellas. Not a bad troll at all. Update 5:09 PM: This story has been corrected to strike a reference to a tech blog, The Verge, being taken in by the Yam scam. Alas, they were not. Apologies.